January | 2014 | I'm Skinny, Now What? I love sports. Not playing them (I’ve never really been an athlete). But watching them is my thing. More than anything, I love the Super Bowl. When I was a kid, we would go to my dad’s friend’s house for a Super Bowl party. The adults would be downstairs with the bar and the two large TVs to watch the game. The kids would be upstairs flipping back and forth between the game and cartoons. As we got older, it stayed on the game. Since then, I’ve been an avid fan of Super Bowl parties. I do my best not to work on that special day, but I was in the office the night of Janet’s nip slip. Being at work afforded me the opportunity not to overindulge myself of all the treats that abound at a typical party. I’ve been to some that serve only meat. Wings, sliders, beef nachos, the works. 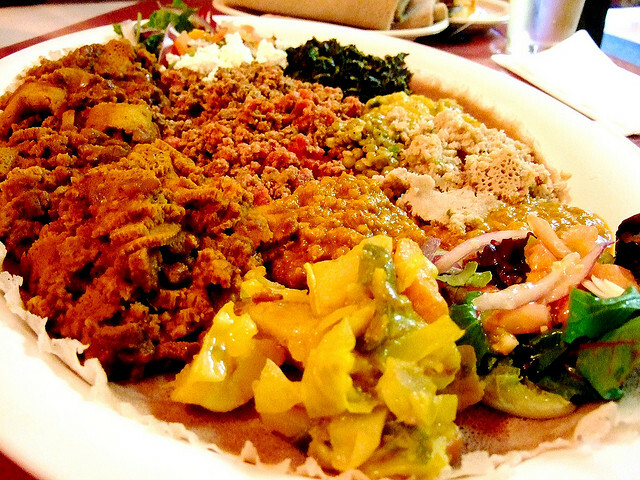 If you’re out Sunday evening, chances are you’ll be tempted to stray from your dietary plan. Temptation is mother. But there are ways to keep yourself on track. 1. Bring a couple of light side dishes. Just as most house parties are BYOB, you can BYOD. Make a salad to bring with you. Go to the grocery store and bring pre-sliced fruits and veggies. You’re not beholden to what’s available at the party. And if you’re in the sharing mood, bring lots. Someone else will also want more than the variety of wings available. 2. Stay hydrated. Common staples of any Super Bowl party are pizza, beer and wings. If you’re not planning to walk out of there bloated, I suggest you drink water before you go and possibly bring a bottle of water with you. Maybe you don’t want to BYOD. That’s fine, but if you don’t want to regret the number on the scale the next day, drink some water. 3. Eat before you go. Super Bowl parties aren’t known for their meals. If you don’t want to linger by the charcuterie plate the entire night, have a decent meal before you go. Just realize this will be a long night. The game may start around 6:30, but there’s hours of pre-game and commercials to contend with. Eating ahead of time will cut down on your snacking. 4. Get in a workout beforehand. So maybe the idea of an evening of pizza, beer and wings doesn’t throw you off. Working out earlier in the day won’t be such a bad plan for you. That way you’ll free up some room for the extra calories. Just remember there’s a lot of fat in the food you’re about to shovel in, and no matter how much you worked out earlier you’ll feel heavy later. Snacking isn’t a bad thing. It actually helps keep your metabolism up between meals. But when you’re faced with the ultimate snackfest, it’s best to have a plan of action so as not to ruin all your good works. I’ll be hydrated and prepped with corn tortilla chips and salsa on Sunday. Buzzfeed also offered a list of non-meat treats for your Super Bowl party. What’s your Super Bowl plan? And who are you rooting for? Once these go in, the world is shut out. Do you remember a few years ago when Jay-Z and Linkin Park released “Numb/Encore?” It had been a while since we’d heard such a perfect melding of rap and rock music. To this day when that song plays, it gets me amped up and motivated. That happened again last night when Kendrick Lamar and Imagine Dragons took the stage at the Grammys. Their performance was one of the highlights of an otherwise long, dry and predictable show. Post-performance I tweeted, “I’m glad I recorded Kendrick and Imagine Dragons, because I’m watching it again.” What I really want is to add the song to my workout playlist. A good playlist or album can be what makes or breaks your workout routine. You want a good mix of songs. Every song shouldn’t have beats as fast as “Bombs Over Baghdad.” You’ll wear yourself out. But you do want good energy. The music should keep you moving. There was an article in The Wall Street Journal last year in which a sports education professor said the musical “sweet spot” for an optimal workout is 125 to 140 beats per minute. To be honest, I don’t count beats per minute. But if that’s your thing, have fun. For me, the songs should be positive and have a quick energy. Music has been a big part of my weight-loss journey. I get pissed when my Nano battery dies during the middle of a run. I can’t really deal with the music at the gym (too much ’80s rock). I work out best with what I like. I mostly listen to hip hop and R&B when I work out. The beats are reliably funky and I can get lost in a groove. I’ll plan on a half-hour run and before I know it, I’m at the end of an album or playlist. The first two songs are key for a good album or playlist. The first song has to have a strong enough beat to get you interested, but it doesn’t have to be the heavy hitter. That role belongs to the second song. The first song gets you moving, the second makes you work. I need my first two songs to drag the workout out of me. I’ve found a few good albums that do this for me. Some of them are old, but they still do the trick, trust me. Ciara, “The Evolution”—The first two songs are “That’s Right” and “Like a Boy.” “That’s Right” didn’t play that much on the radio, but when I first heard the song, all I could do was jump around my house. It’s got amazing energy. This is the album I play when I really don’t feel like working out because the energy of the first song is undeniable. Then “Like a Boy” comes on and I can’t be stopped. T.I., “King”—When I began my weight-loss journey, this was one of the first albums I listened to at the gym. The first song, “King Back,” has a announcer’s intro for a boxer. So if you need to feel like you’re about take over, this is the album for you. Beyonce Mix—Lately, Yonce has been in heavy rotation for me at the gym. I’ve got everything from “Crazy in Love” to “Partition” and it’s awesome. Beyonce knows how to keep you moving and motivated. My playlist is almost an hour and a half long, and I love every minute of it. Imagine Dragons, “Night Visions”—As I said earlier, Imagine Drangons’ performance with Kendrick was amazeballs. The album is even more amazeballs. “Radioactive” is the first song to play and it’s got the perfect energy to get you started. As you get further into it, the songs slow down a smidge, so keep that in mind if you don’t like that sort of thing. Katy Perry’s “Dark Horse”—When you’re in a class, you’re at the mercy of your instructor. My spin instructors love this song, and it’s grown on me. Don’t let Katy’s bizarre Grammy performance fool you. “Dark Horse” is a banger. I can’t say that for the album. 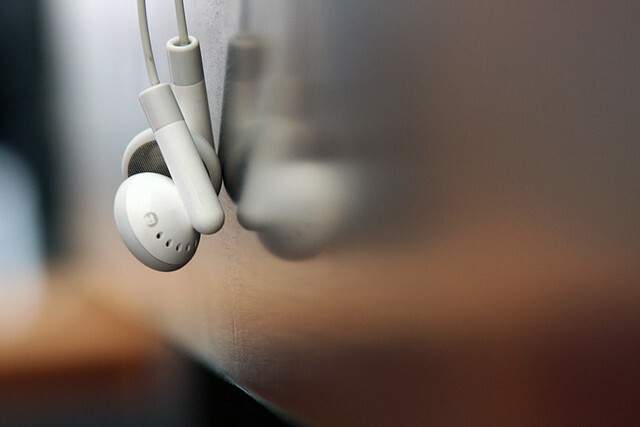 What’s on your playlists for a good workout? I’m taking suggestions. Honestly, I don’t even know what all is on this plate. I do know you don’t need it all, though. Living your life means enjoying all of life’s pleasures. One of those pleasures for me is going to a nice restaurant. Lucky for me, New York has no shortage of them. One of the things I noticed when I moved here is what I like to call New York-sized portions. As a girl from St. Louis, I’m used to food being piled high on my plate. I’ve seen steak covered in roasted potatoes taking up every inch of my plate, with my vegetables brought out in a separate bowl. Depending on where you go here, you’ll have the tiniest sliver of steak sitting atop a bed of sauteed spinach with a couple of potatoes dotted on the plate. And that’s your full meal. This isn’t typical of every place, but it’s not uncommon. But maybe you’re not a steak eater. Maybe you’re in the mood for fish. It doesn’t really matter, because you’ve got a food plan you’ve got to stick with. No matter how much or how little food is on your plate, remember you’re not a child anymore. You don’t have to clean your plate. But how do you enjoy your dining out without paying heavily for it in the morning? Save some for later: Many restaurants give you way more food than you need. One of the tricks I learned early on is to slice the dishes on my plate in half and and take the rest home in a doggy bag. If that’s not your thing, a lot of restaurants give away food at the end of the night to people in need. You can offer up your extras, or maybe you’ll pass someone in need on your way home. Now you’ve done a good deed and avoided wasting food. Don’t you feel better about yourself? Water is your friend: One of the many added benefits of water—besides lubricating your joints, hydrating your skin and keeping you alive—is that it can help as an appetite suppressant. When I get cravings, I drink water and chew gum. If I’m still hungry in about 15 minutes, it’s time to eat. When you drink water before meals, you’re keeping yourself from overeating. And it’s water! I love water (weird but true). A nice cold glass of water will get me every time. Knowledge is power: There are certain chain restaurants that boast a healthy menu when it’s loaded with sour cream and cheese and cooked in salted butter. I like a hearty meal as much as the next gal, but if you’re on planned eating regimen, you should know what you’re putting in your body. Ask the server how your meal is prepared. See if it can be cooked a different way. Or ask your server for a lighter suggestion. There are plenty of places that offer lighter fare on the menu. Try out something new. Dining out doesn’t have to be the death of your new healthy lifestyle. Look at it as a new beginning. You can try smaller portions of different foods that work with your plan. Just don’t forget the water. What do you do to stay on track while dining out? And if you’re a cafe fanatic, like myself, Well+Good did a great post about what to get at your local coffee shop. I remember when I was a teenager, and my mom and I were shopping at the mall. I was wearing an oversized gray sweater and gray leggings with tennis shoes (trust me, I have elephant brain). As we were browsing the juniors section I hear a guy talking to his friends about the “big girl” looking at clothes too small for her. I tried not to pay too much attention to it, thinking he’s talking about someone else. But as I picked up a dress, he spoke a little louder about how I was so big I looked like a cloud (the gray) and how I needed to just put the dress down. My mom was out of earshot and on the other side of the section, so I just left and went to her. I’ve lived most of my life well above 150 pounds on my 5-foot-2 frame. My skin has hardened to such comments, but my tolerance for bullying behavior like that has become vapor thin. In the past few months, body-shaming has become more popular. Cloaked under the guise of drawing awareness, businesses like Lululemon, organizations like PETA and even feminist blog Jezebel have made it their business to point out their perceived flaws with a larger body type. 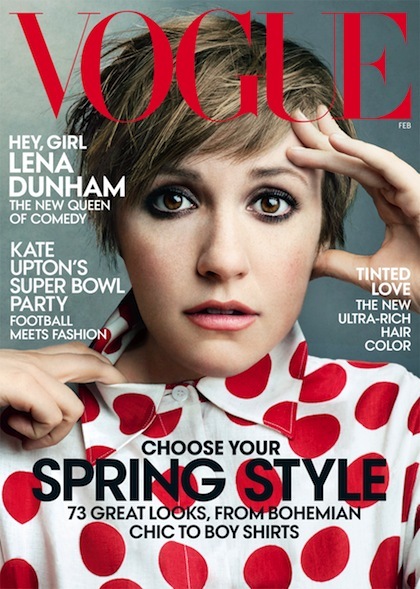 Last week “Girls” multi-hyphenate Lena Dunham appeared on the cover and in a nice spread for Vogue magazine. Vogue, like most fashion magazines, is known for extensive photo retouching of photos. A longer arm here, a slimmer neck there, lower lighting right there, it’s a thing that happens. But Jezabel, which has been an ardent supporter of Dunham’s for some time, offered $10,000 for unretouched photos. Our desire to see these images pre-Photoshop is not about seeing what Dunham herself “really” looks like. …This is about Vogue, and what Vogue decides to do with a specific woman who has very publicly stated that she’s fine just the way she is. Within a couple hours, the site got the images and Clawd’ve mercy, the images were retouched! Coen herself admitted that there wasn’t a big difference between the originals and the retouched ones. But she stood by her argument that this was about Vogue painting an unrealistic image. You what else is unrealistic? Makeup, pushup bras, high heels, spanx, hairspray, the lighting on “The View.” Everyone does something to make themselves look or feel better. Instagram feeds are full of filtered images to put people in the best light, but Jezabel has no qualms about that. Vogue has been doing this type of thing for years. I see no problem with retouching as long as it’s not ridiculous. There’s one shot of Dunham where her arm is missing. There are some shots Vogue uses that make people look like bobbleheads. But there’s no need to shame Dunham’s body type, which isn’t totally uncommon to see, to make a point about a misperceived wrong. Recently animal-rights group PETA was accused of fat-shaming by several media outlets for its “Plan V” campaign, PETA’s attempt to enter the reproduction debate with it’s own agenda. PETA wrote a letter to “population-stabilization” group Population Connection after a report came out that Plan B contraception may not work effectively on women over 176 pounds. Fat shaming is not now, nor has it ever been, an effective way to get women’s weight under control. Weight is a very personal thing. It is probably the only outward aspect of a person that is still considered open for debate. It is also something that can be very hard to control. One person’s beliefs shouldn’t dictate how you live your life. Further more, PETA should have done more research before suggesting that women over 176 pounds need to just go vegan so they can use Plan B. The animal-rights organization issued a statement after being called out for fat-shaming, saying that it only wanted to offer another option. The people behind the original statement didn’t take into account how sensitive an issue weight is. If you ever feel yourself on the receiving end of this type of bullying, understand that whoever’s throwing it at you doesn’t really know you. Someone who loves you wouldn’t make you feel ashamed of being who you are. Whether you’re a work in progress or at the end of your weight-loss journey, it’s no one’s right to tell you how to look or live your life. Do you, boo! I talk a lot on this blog about the necessity of keeping up with your workout. I’ve also talked a lot about how I’m not perfect and my love of Goldfish crackers and comfy sofas make this hard, but I still persevere. I do this to show that I did not wake up like dih. I am a flawed human being. I go through phases, like most people, where I’d rather sit and clear out my DVR or binge-watch “Breaking Bad” than go to the gym. Hell, it took me five hours from the time I got up this morning to start writing this post. You know what I did in the meantime: nada. I read a couple chapters of a book; I walked my dog; I watched “Dexter” on Netflix; I took a nap. None of those things, besides walking the dog, was something that needed to be done. I just didn’t feel like it. And that’s a problem that you’ll face on your journey toward your goal. Some days, no matter what, you just won’t feel like it. Everything under the sun sounds more appealing than exercising. You know what’s more fun than spin class? Puppy cuddling. What’s more appealing than Zumba? Cookies and a “Game of Thrones” marathon. So how do you get past the allure of being sedentary? 1. Just Go. Really, that’s the first step. It’s always the hardest, but it’s the most important. Not many people ever really want to go to the gym unless they’re being paid for it. If it’s not your job, then you have to find some other motivation. Even though I may have stayed up too late the night before or the dog was hacking all night, I’ll force myself out of bed and go to the gym. I tell myself that the 20 minutes I’m going to do on the elliptical are more than most people will do all day. Those 20 minutes can turn into 25. Then I hop on the stationary bike for 15 minutes, which turns into another 20. By then I’ve done 45 minutes. 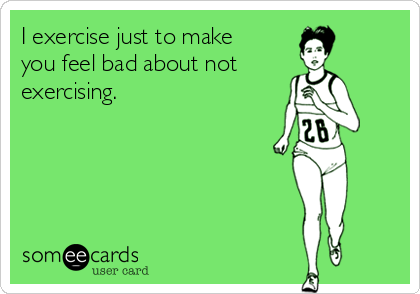 And since I can be a little OCD, I’ll do 15 minutes on the treadmill to make it a full hour. All that by just getting out of bed and going. 2. Plan Ahead. If you’ve already made your meals for the week, got your clothes set out and scheduled time, there’s little in your way to keep you from doing your workout. Sometimes we need a little structure in our lives. So if you can’t function without time limits, this is the step for you. Preparation is necessary in any weight-loss plan, anyway. You don’t go scuba diving without instructions. You don’t start a weight-loss plan without knowing what you’re getting into. Just prepare yourself, and you’re ready to stay on track. 3. Make It Quick. You don’t have to go hard to get in a good workout. I have some exercise DVDs at home that are only 30 minutes. That’s it: 30 minutes! What else are you doing today that you can’t take 30 minutes out of your day? Really, I’m asking. Some of you have kids and spouses and mortgages. I have none of that. I have a 12-year-old dog who sleeps all day in my apartment. It’s easy for me to take time out for a quick workout. Out of the 24 hours in the day, is every minute of them accounted for? If not, try to consolidate about 30 to do something good for yourself. 4. Reward Yourself. I think this comes from childhood, but I sometimes feel I don’t deserve treats until my chores are done. For example: I can’t leave to meet friends until my home is straightened up. I don’t get dessert until the dishes are in the dishwasher. I haven’t earned that new dress until spin class is over. For me, it’s about earning points for a treat. So what do you do to treat yourself? Maybe you want the 10-minute massage after your mani-pedi. Well, you’ve got to earn it. 5. Take Pride in Doing Something Others Aren’t. I know this is bad, but it helps keep me motivated. When I leave the gym and have to go to the grocery store, there’s a little bit of pride that comes with my sweat stains. That pride comes from knowing I look awful, but I look awful for a reason. There are people at the store who look bad because it’s Tuesday. You’ve earned your worn-out look. Wear that badge with pride. 6. Vision/Pinterest Board It. What’s the light at the end of your tunnel? A good way to stick with any plan is to have a set of goals to achieve. If you plan on being beach-ready by summer, the best time to start is now. If you have a wedding in the fall, remember that fittings start in the summer. Put up pictures of what you want, be it a vacation in Nice or a destination wedding in St. Barths. Keep a reminder to yourself that you have a goal you need to achieve. Women’s Health magazine compiled a list last year of a few things people need to do to stay on track. What do you do to keep yourself motivated?